Discussion in 'The Lounge' started by N8 v2.0, Dec 20, 2005. 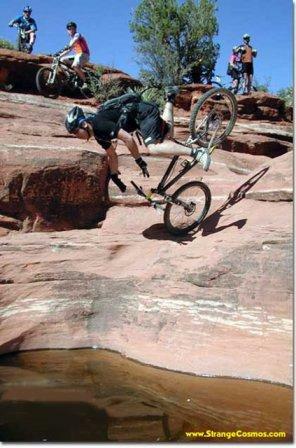 "I knew I should have bought a 29er!" one day i'll be able to flip outta this just like bikerfox, parctice, practice, practice. "but people said i wouldn't be cool if i didn't have Hope 12 pots"
"ruck and doll, phuck and poll, duck and ... ouch!" 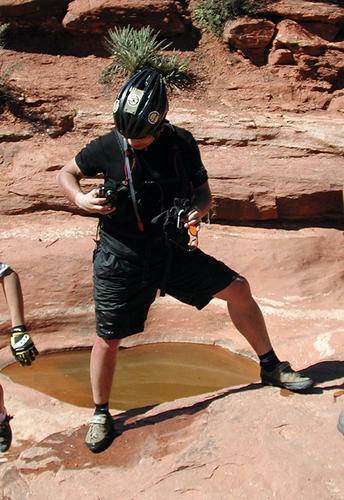 "damn it's hot out here i think i'll go take a dive in that puddle over there"
So was the dude ok then? That fall looked nasty! Just punishment for wearing a doo rag. "Here is the bronze medal dive. Although he scored well with the progressive American judge for augmenting his performance with the bicycle, the Russian judge (being more of a purist) deducted extra points because his feet came apart before he entered the water." "Rock. It's what's for dinner." The first -Front Flip Nothing- EVER captured on film ? ? ? The guy was thirsty so what? Jerry sadly discovers that its not a good Idea to Eat Bean Burritos before riding. That's what you get for wearing a dew rag punk. So was the dude ok then? He got wet, and survived. His camera got wet, and didn't survive. "I shouldn't have run my seat so high...."
That is "The Amazing Raymond," the former Creative Director for consumereview.com. Example of why you should always run the front brake on the LEFT side. that photo is over 3 years old, fyi. Well thank you Capt. Killjoy. Actually it's the ones with algae and stuff living in it that you want to drink from in the desert. The pools that are perfectly clear often contain alkali and are poisonous.